Partly cloudy this evening followed by increasing clouds with showers developing after midnight. Low near 50F. Winds S at 10 to 15 mph. Chance of rain 40%.. Partly cloudy this evening followed by increasing clouds with showers developing after midnight. Low near 50F. Winds S at 10 to 15 mph. Chance of rain 40%. 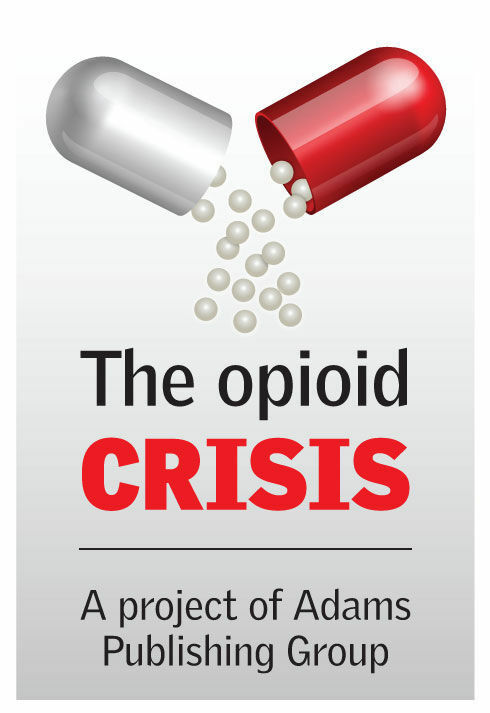 This is part one of a three-part series by Adams Publishing Group newspapers about the nation’s ongoing opioid crisis. That’s a little more than one a day in the county that’s home to Mount Airy, the town actor Andy Griffith used as the inspiration for idyllic Mayberry on “The Andy Griffith Show,” which ran on television in the ‘60s. Drug overdoses killed 32 people, or about one every 11 days, last year in Surry County. Those overdose deaths were down 42 percent from 55 in 2017 — not because overdoses dropped, but because first-responders saved more people through widespread use of the opioid overdose reversal medication naloxone. Hundreds of other county residents bypassed 911 calls and were taken directly to the hospital. If the U.S. opioid epidemic can reach Mount Airy, which the local tourism bureau proudly proclaims is often referred to as “Small-town USA,” it can strike anywhere. And it does. A total of 399,230 U.S. residents died from opioid-related causes from 1999 through 2017, according to the U.S. Centers for Disease Control and Prevention. That’s the equivalent of the entire cities of New Orleans or Tampa or Cleveland, or 70 percent of the population of the state of Wyoming, being wiped off the map. Gone in less than two decades. “In terms of the overall number of overdose deaths, the epidemic is unprecedented and has wide-ranging negative effects, not only on individuals, but on their families and communities,” said Nora Volkow, director of the National Institute on Drug Abuse. Opioid overdoses, which kill 130 people a day in the U.S., are a driving force behind the United States enduring its longest sustained life expectancy decline since World War I. Americans now have a greater chance of dying from an accidental opioid overdose than from a vehicle crash, according to the National Safety Council. Though much progress has been made in the fight against opioid addiction, the number of overdose deaths from the drugs continues to rise – climbing 13 percent from 42,249 in 2016 to 47,600 in 2017. And the CDC estimates this ever-evolving national crisis has an annual economic burden to the nation of $78.5 billion, including the costs of health care, lost productivity, addiction treatment and criminal justice involvement. Opioids are a class of drugs that includes the illegal drug heroin, synthetic opioids such as fentanyl, and pain medications available legally by prescription such as oxycodone, hydrocodone, codeine and morphine. The opioid crisis originated around the turn of the millennium, driven mainly by the overprescribing and diverting of opioid pain medications in the first decade, Volkow said. As prescriptions ran out and doctors began to cut back on prescribing opioids, many users sparked the second phase of the crisis by turning to cheaper illicit opioids, such as heroin. In the past few years, powerful synthetic opioids, such as fentanyl, have started taking over the market and now are blamed for more overdose deaths than either heroin or prescription painkillers. Their potency makes synthetics, which are being substituted for heroin or used to lace counterfeit pain pills, easier to smuggle into the U.S. and more profitable for dealers, Volkow said. With the CDC reporting that fentanyl is 50 times more potent than heroin and 100 times stronger than morphine, this third wave of the opioid crisis threatens to be the deadliest of all. “Had it not been for the introduction of fentanyl in our state, we may have started to turn this thing around by now,” said Alisha Nelson, director of RecoveryOhio, the agency Ohio Gov. Mike DeWine created shortly after taking office in January to address the opioid challenge. In 2017, Ohio ranked No. 2 behind only Pennsylvania among all states for the most drug overdose deaths with 5,111, and also had the second-highest overdose death rate, at 46.3 deaths per 100,000 residents, trailing only West Virginia’s 57.8. In many ways, the opioid problem can be viewed as the product of good intentions gone horribly wrong. Remarkably, Dr. Nancy Dawson, an internal medicine hospitalist at Mayo Clinic in Jacksonville, Florida, points to a five-sentence letter to the editor published in the prestigious New England Journal of Medicine in 1980 as being a key, but unintentional instigator of the epidemic. The letter declared that a review of nearly 12,000 patients in a Boston drug surveillance program who received narcotics yielded only four well-documented cases of addiction, and thus concluded that development of addiction is rare in patients with no history of it. Without the fear of addiction, doctors began to prescribe opioids more liberally, Dawson said. Opioids no longer were reserved for treatment of acute or terminal pain. At the same time, the paper asserts, government agencies began to evaluate doctors and hospitals on their control of patients’ pain, and ultimately tied reimbursement to patients’ perception of pain control. That led to more opioids being prescribed, which resulted in more individuals becoming addicted. Adding fuel to the simmering fire, pharmaceutical company Purdue Pharma, in the late 1990s, began aggressively marketing its opioid painkiller OxyContin for the treatment of chronic pain and highlighting its lack of side effects. Opioid prescriptions skyrocketed, although changing practices since have caused the national rate to decline from a high of 81.3 opioid prescriptions per 100 people in 2012 to 58.7 in 2017. But in 2007, after millions of Americans had become addicted, a federal court ruled that the promotion had provided false information about the addiction potential of OxyContin and fined Purdue Pharma $634.5 million. Purdue Pharma is among several pharmaceutical companies being sued by hundreds of municipalities across the country, including 71 of Wisconsin’s 72 counties, in an effort to recoup some of the costs of responding to opioid-related concerns. The cruel irony is that what began as a ramped-up effort to control patients’ pain led to one of the most painful chapters in American history – and one that is still being written. Wisconsin Attorney General Josh Kaul recently called the opioid epidemic “the most significant public-safety challenge we face” and talked about its human toll, both in terms of lives lost and people who wake up every day facing an addiction, as he announced Wisconsin was joining a multistate investigation of opioid distributors. “Part of our response must include looking into whether conduct that may have contributed to that epidemic was unlawful and, if so, holding accountable those who broke the law,” Kaul declared. The opioid epidemic is personal for Police Chief Monte Nelson of Northfield, Minnesota. His two daughters attended Northfield public schools, and he estimates their classes lost more classmates to overdose deaths than any other grades. Monte Nelson can still picture a friend’s curly-haired son hanging out by a bonfire in his yard during high school. Seven years later, the young man was dead from an opioid overdose. The crisis reared its ugly head in 2005, when a young adult died from a mixed opioid pill overdose, shocking the community. Northfield faced a huge educational curve. A drug task force member learned that small groups of young addicts were driving the 45 miles to Minneapolis to get their heroin, and that many of them had learned to bring each other back from overdoses by performing what the police chief described as violent CPR. The community rallied together and started a drug court, expanded treatment programs and launched one of the first excess medication drop-off initiatives – the effort has collected 23,000 pounds so far – to slow the commonplace pattern of teens and young adults “shopping” for pills in the medicine cabinets of friends and family members. As a result of those efforts and widespread use of naloxone by first-responders, opioid deaths “took a little hiatus” before roaring back in recent years with the introduction of fentanyl and carfentanil – a synthetic opioid 100 times more potent than fentanyl that is also used as an elephant tranquilizer – into the market, Monte Nelson said. The town of about 20,000 residents had three people treated for serious overdoses in a 48-hour period in March 2018 after ingesting pills they thought were oxycodone that were laced with carfentanil. “We’re still in the middle of this crisis, and it’s getting worse with fentanyl and carfentanil and the stuff available off the dark web,” Monte Nelson said. The story is similar about 60 miles north of Seattle in Skagit County, Washington. The rural county endured seven overdose deaths in the first three months of this year, all suspected of being caused by synthetic opioids, said Undersheriff Chad Clark. Indeed, fentanyl is so potent that it presents a danger to officers responding to calls where it is present. Skagit County now arms officers with extra-strong doses of naloxone – also known by the brand name Narcan – for themselves, and requires two deputies to respond in case the one handling a fentanyl-laced drug stash goes down and needs to be revived. Such precautions are now taken from North Carolina in the Southeast to Washington in the Northwest and everywhere in between, as the nation seeks to fight back against a crisis that can seem overwhelming as it strikes people of all ages, races and incomes. Reach Editor Philip Weyhe at 507-931-8567 or follow him on Twitter @EditorPhilipWeyhe. THIS WEEK: We hear a lot about the nation's "opioid epidemic," but what's the real scope of the problem? NEXT WEEK: What's being done to treat those who have become addicted and what more is needed? APRIL 24: What's being done at the local and state levels to try to combat the problem?